Click here to download a copy of the PCA Annual Report for 2011, including an account of the activities of The Friends of Dyke Road Park, as presented at the AGM on 25 January 2012. We have lived at no. 19, next door but one to the Church Hall for over 12 years. During that time, we have had a number of distressing occurences as a direct result of the activities in the Hall and it is important to remember in your discussion about community, that we are the community too!My husband has a disabled badge and cannot walk far. On numerous occasions people dropping children off or picking them up from the Hall have parked in the disabled bay and not infrequently told us to f… off when we politely asked if they could move. We have had unsupervised youths running down the middle of the road at 9pm on a Friday night (the Youth Club we believe) and daring each other to run as near as they can to on-coming cars. We have had children and young people climbing on our wall, our fencing and our pillars. We have had youths playing knock-down Ginger at 9pm at night – banging hard on all the doors near the Church Hall and running away. This frightened the little old lady who lives next door to us – and we didn’t want to suffer that either. She, as we, are also members of the community you speak of! We could go on, but suffice to say it has not been altogether a pleasant experience to live next to the Church Hall. We do want you to put the other side of the equation on our behalf. In the essence of presentating a fair picture of the reality, rather than the rhetoric, this is essential. Most importantly, the community activities (and we would argue whether the Hall is the hub of the area – it is empty most of the time, and not like a village hall which has a completely different community purpose) have only to go round the corner into the Church itself. Nothing need be cancelled – just held there instead. It is a vast, and again it would appear mostly empty building for a lot of the time. Isn’t that what the Church was originally intended for? i.e. a meeting place for people of all ages (and not just for services and related gatherings). Most worryingly, when a friend had someone knock on her door with a petition and she also asked why the community activities could not be welcomed in the Church she was told ‘we don’t want people in there, we have some valuable items there!’. Thus we want you to make clear to people at the meeting and indeed to understand yourselves that there is a definite ‘downside’ to living near the Hall and these are only a few of the problems we’ve had. We look forward to your confirmation that you will present a balanced picture of the pros and cons of the Hall remaining as it is and will include our email in any way that is appropriate. 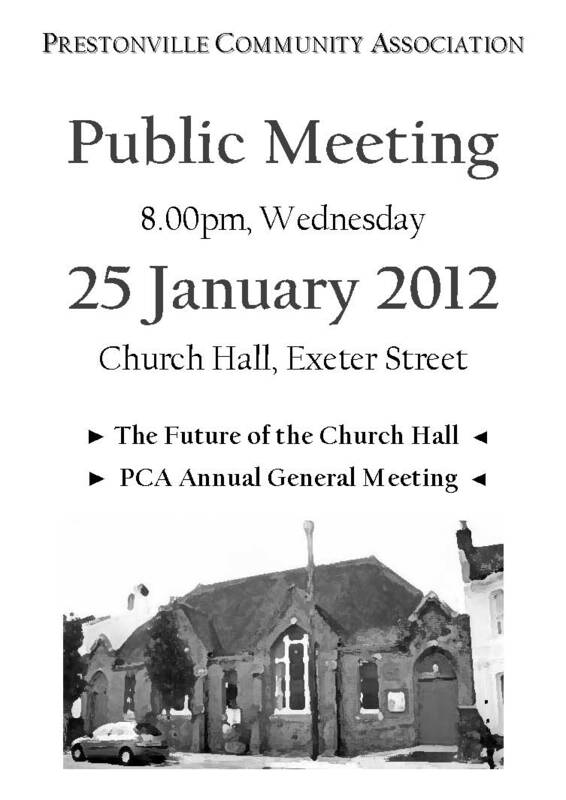 The Public Meeting about the future of the Church Hall in Exeter Street is also the Prestonville Community Association’s Annual General Meeting, at which we elect the PCA’s Committee. We consider all Prestonville residents to be members of the PCA, and if you’re over 16, you have a vote. We’ll be discussing the future of the Exeter Street Church Hall at this year’s PCA AGM, with news from the Vicar, Revd Martin Poole, and a presentation from thehallgetinvolved. It would be good to see a good turn out from the community. As always, there is room on the PCA Committee for new members.